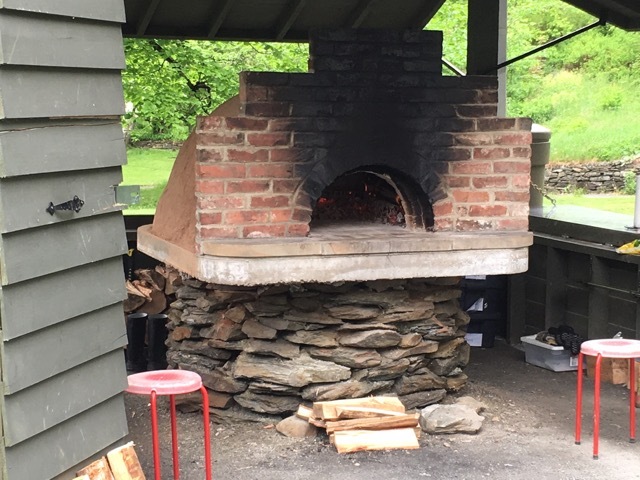 What is a community oven all about anyway? The six-year-old Park Avenue Community Oven (PACO) in Dartmouth looks a bit like a garden shed from a distance. It stands in a grassed area surrounded by mature trees and a newly planted urban orchard. Expect the unexpected at PACO. When the three sides of the oven structure fold down, visitors can see stainless steel counters ready for rolling out pizza dough. The rounded, five-foot high Cobb oven stands in the middle atop a circle of stone masonry. It is glowing with powerful wood-fired heat. Lead volunteer Bernie Tremblay is there to introduce us to the concept with a pizza in hand. He explains there are another 60 volunteers willing to fire up the oven for community groups to use on Saturdays. The oven is generally utilized between noon and 3 p.m.
Darren Hirtle, another volunteer, has dough ready to roll out out. As he works he says he loves food and helping at the oven gives him the best feeling as a volunteer. The oven, which cost $20,000, is used for a wide variety of get-togethers - from Pride picnics to retirement parties and immigrant meals. All of the wood for the past six years, Tremblay points out, has been donated by one local firm. The oven, he believes, brings more people to the park. Having the oven enclosed by a simple, but well designed little building keeps it secure. The sole act of vandalism occurred when an individual entered and left the door ajar. “It’s really been embraced by the council and residents,” Tremblay says. According to Tremblay, initially folks in Dartmouth were cautious, but since the oven’s use has evolved they’ve warmed up to it. An operating manual has been created and seasonal operating costs have totaled about $1,000. Cooking tips for an oven that operates at 850 - 900 degrees were welcome to begin with, but now the volunteers know that a white hot oven is ready to cook. In fact, Hirtle’s pizzas have cooked in no time as Tremblay chatted with the visitors and they are delicious. The first oven cracked, he noted. A second was built on the same base in the 210 square foot building. The two gables are open to the air with a simple chicken wire covering that ensures superb ventilation. 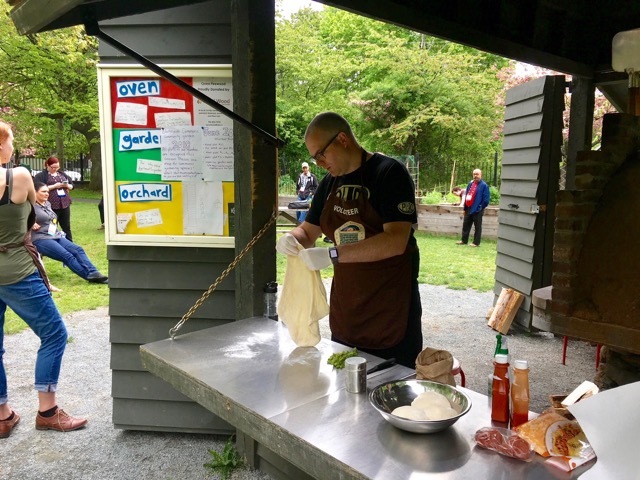 A community oven, like the one in Dartmouth, is going in at Baddeck after a community member saw the existing one. Located in the wonderful park setting of Leighton Dillman Park, there are picnic tables for eating near the oven, beautiful trees all around and running water access. The PACO is open every Saturday, until the end of November, as long as it is not raining. A fire gets lit early Saturday morning in the oven and is usually hot enough for cooking pizza by noon. Once the oven is hot, a pizza cooks in approximately one, maybe two minutes. It is between 800 and 1,000 degrees at its hottest. It was pretty amazing to watch. All the tools you need to use the oven are supplied, however, you have to bring plates, napkins, utensils and, of course, all of the ingredients! There is plenty of room for more than one family to roll and dress their pizzas. And you can make so much more than pizza. The PACO has been used to cook vegetables, meat and bread as well. There are countless ovens now in Europe and across North America. Duncan Ebata of Wolfville grew up with the cooking style in his Ontario hometown. He and Adam Barnett, who founded The Grapevine, are keen to have one in Wolfville. They’ve launched a crowd-funding page to help fund raise for a non-profit outdoor cooking space. They hope to get underway late this summer or early fall. Having seen the concept at work in Italy, Ebata is sure the non-profit concept will make residents excited about cooking together and add to the collective happiness of the community. 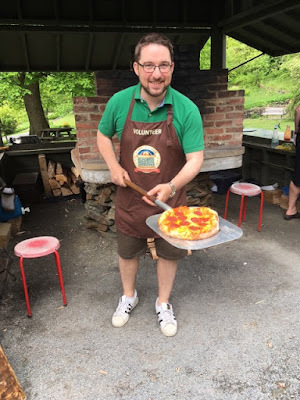 He and Adam have been planning for a community oven since last year. They expect it will cost about $22,000 to construct a 12 by 12 foot structure to house the oven. The concept has received initial approval from Wolfville town council. They would like to install the oven at the Robie Tufts Nature Park. The duo say they’ve engaged various stakeholders for support and around issues, such as how to avoid disrupting the area’s chimney swift population. 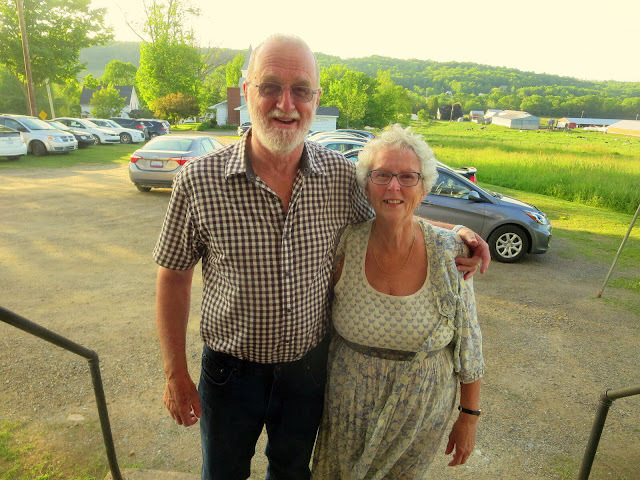 “We've overcome many of the early risks and challenges by getting key support from the town, the WBDC, Blomidon Naturalists Society, Wolfville Farmers' Market, etc. According to Duncan, there are already two or three outdoor ovens in the area. He has a builder all lined up. 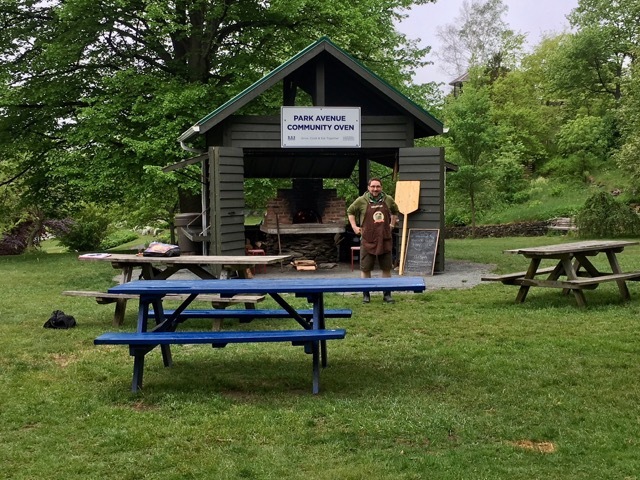 Community ovens have an incredible ability, Duncan says, to bring people together to share in the spirit of food and community while enhancing public spaces. And of course, to make and enjoy delicious pizzas! To donate to the crowd funding campaign, visit the project’s Kickstarter page. To volunteer during the construction stage, email Duncan Ebata and Adam Barnett at hello@wolfvilleoven.com. • Support community development by creating space to get together and make meaningful connections. • Increase community food security and increasing quality of life for all. • Increase education around making food, utilizing local ingredients, and general food literacy. • Encourage economic development by creating opportunities for local businesses. • Add to the health and vitality of downtown Wolfville through peaceful public gatherings. • Improve job readiness and entrepreneurial skills through volunteer opportunities (communication, risk taking, planning, creativity etc.). • Provide safe and supportive social and physical environments for all people (i.e. wheelchair accessibility). • Support good mental health and wellness by helping to address social isolation and building a sense of community belonging. • Align with and support activities related to Citta Slow and Fair Trade Town designation. • Provide opportunity for partnerships with and promotion of local events such as Deep Roots, Devour, Apple Blossom, Mud Creek Days, Acadia events, etc. • Weekly bread baking sessions with opportunities for anyone (including food kitchens, families, elders, low-income residents, etc.) to come and bake their weekly bread (regular, gluten-free, etc.). • Teach and share skills such as baking, meal planning, and cooking using cheaper cuts of meat to make soups and stews. • Educate people on how to make and prepare nourishing food by incorporating local vegetables and whole grains into their diet. • Community members can book the space and have gatherings and celebrations there, with support of a supervising volunteer.